GitHub - eapowertools/GovernedMetricsService: Qlik Sense Governed Metrics Service - Deploy centralized metric definitions to specific apps in Qlik Sense. Want to be notified of new releases in eapowertools/GovernedMetricsService? Please read the Governed Metrics Service documentation before installing the Governed Metrics Service. 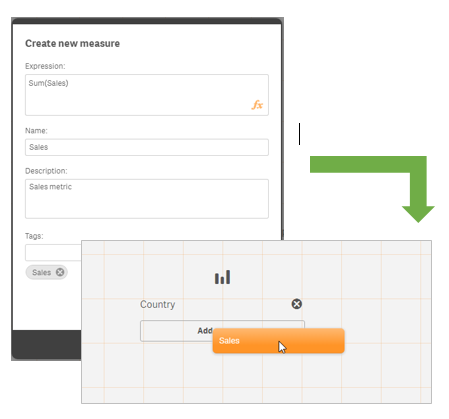 The Governed Metrics Service uses the Qlik Sense Service Dispatcher and Nodejs to launch a REST api as a background service for updating metrics in Qlik Sense applications. Therefore, the Governed Metrics Service requires Qlik Sense Server. The Governed Metrics Service has been tested with Qlik Sense 3.1.x and 3.2. For now, the Governed Metrics Service requires a licensed Qlik Sense server site running version 2.2.4 or higher. Please do not install for use with Qlik Sense desktop. The Governed Metrics Service will not work. To install the Governed Metrics Service, use the installer. Qlik Sense enables self-service visualization with a balance of control and agility that gives IT confidence that the visualizations that users are empowered to create are correct. One way this is enabled is through the use of Master Items. A Master Item is a dimension or measure that is defined by a central IT or BI team or line of business analyst and deployed to users in conjunction with a Qlik Sense application. This capability enables users to create visualizations with trusted dimensions and measures without having to author or understand the underlying business logic. This is an important requirement of modern self-service analytics platforms. The Qlik Governed Metrics Service (GMS) Power Tool builds upon this capability by allowing metrics that are defined externally to Qlik Sense to be loaded and applied to one or more applications. The metrics that are loaded to each application are configurable and managed through the Qlik Management Console via custom properties. Metrics defined in an external database or XLS. Metrics extracted into a Metrics Library QVF application. GMS Power Tool reads the Metrics Library QVF and applies metrics to one or more applications. The Governed Metrics Service is part of the EA Team Governed Self-Service Reference Deployment. To learn more about governed self-service and how to centrally manage master library dimensions and measures in your Qlik Sense site, visit the Governed Self-Service space on Qlik Community. For more information, please visit the EAPowertools space on Qlik Community.